Most of the veteran RuneQuest players started off with the second edition in 1978, but I have never played it. It was actually RQ3 the one I started with. It was also the first RPG I ever played. This was the first edition published in Spanish, and it was also quite successful in my country. With my friends, I have played the 3rd edition an awful lot, and we still play in my Pavis and Prax campaign from time to time. Recently, I've been running a RQ6 (aka Mythras) campaign set in medieval Japan. Although I have never played Pendragon either, I've stolen some of its winter-phase mechanics for my samurai game. I have also played the Colymar campaign with HeroQuest. Of course, I have played other games, like Call of Cthulhu, but these are the most relevant to this review. Also, Chaosium was kind enough to provide me with a review copy of the rules (it's better to be honest about it, but I promise my opinion about the rules has not been influenced by this!). OK, I have been eagerly expecting this book since I heard the news, back in 2016, that a new edition was being produced. As you may have guessed from the looks of this blog and even my nickname... yes, I'm a sucker for all things RuneQuest and Glorantha. So when anything combines those two, it's bound to draw my attention, strongly. And actually that's one of the main appeals of this new edition, because there hasn't been any RuneQuest rulebook that combined rules and setting since the second edition from 1978. Yes, there were many supplements about Glorantha published either for RQ3 or Mongoose RuneQuest, and even RQ6 almost had its own Gloranthan interpretation (Adventures in Glorantha), but the new managers at Chaosium decided it was about time Glorantha was meshed with RuneQuest right from the start. In the interim, the different iterations of the RuneQuest rules have been treated as a generic fantasy game, suitable for different settings, with Glorantha being only one of the worlds to play in. Why? Because the original RQ2 rules were so innovative in their time, that Chaosium went on to use them for a plethora of other games, like Call of Cthulhu or Stormbringer. Unlike these games, whenever a new edition of RuneQuest appeared, the rules were always divorced from any particular setting, so people could use them to play in whatever fantasy world they chose. Both ways of presenting the rules work, really. You can have a generic rulebook and then a supplement that adapts the rules to a particular setting. Or you can have rules and setting together. However, I remember when I first peeked into the Stormbringer rulebook (the 4th edition) it surprised me to find aspects of the setting meshed straight away with character creation. Like, for example, if your character was from Pykaraid, she would roll more dice to determine her strength, because the inhabitants of that land are known for being strong. I thought this was a remarkable idea, because you start learning about the world your character lives in while you learn the rules. Of course, back then Chaosium could have published a supplement for RuneQuest allowing you to play in Moorcock's Young Kingdoms with those rules. Instead, they chose to publish Stormbringer with its own set of rules because that way the rules are better suited to the setting. And that's what Chaosium has done this time with RuneQuest: Roleplaying in Glorantha. Let's have a look at it. The list of acknowledgements includes Pete Nash and Lawrence Whitaker, the authors of the 6th ed. Michael Moorcock is also included, as well as Penelope Love, the author of a cool Gloranthan novel. What strikes the reader the most at first sight is the lavishly illustrated full-colour pages. This is new for RuneQuest, as none of the previous editions had ever enjoyed this level of high-quality production. The cover itself is quite striking. Far from being another homage to the cover Luise Perrine did for the 2nd edition, like Mythras or the RuneQuest Quickstart, or a couple of generic warriors as in the cover of RuneQuest 3rd ed., this shows a group of flying warriors wearing Bronze Age armour like Corinthian helmets, all of them rallying behind a central blue-skinned figure wreathed in lightning, magic and runic tattoos. All these characters are looking at you like saying "Here we are, we are cool and powerful, so you'd better fight on our side". This cover by the talented artist Andrey Fetisov draws your attention and I'm sure it will make the book stand out in the shelves of RPG stores. It's as special as Glorantha itself and I hope that, if you didn't know anything about RuneQuest or Glorantha, it could very well make you wonder who is this blue-skinned guy and perhaps intrigue you enough to want to know more. On the other hand, veteran RuneQuest players will recognise these warriors as Orlanthi, one of the main cultures in Glorantha, and the blue-skinned guy must either be an Orlanthi rune lord, the orlanthi hero Argrath or, my own guess: Orlanth himself, god of Air and Storm. By the way, this beautiful illustration is a retouched version of the one gracing page 12 of the 13th Age Glorantha book. The main difference being that the RuneQuest cover includes the sample characters that are used throughout the book as examples of play. Having the example characters on the cover has been a healthy tradition in some very successful past editions like RQ3 and RQ6. One of the possible complains that could be made at the cover is that the world of Glorantha encompasses much, much more than just this one culture. But I still think it's appropriate, because RuneQuest: Roleplaying in Glorantha mainly focuses on the inhabitants of a region called Dragon Pass, most of which belong to the Orlanthi culture. It's also a good cover because it already tells you that this is a fantasy world, similar to the Bronze Age, with lots of cool magic, like swords made of lightning, and flight spells. If you happen to know more, the cover also tells you about cults, runes or even gods, all of which are distinctive features of Glorantha. As for the interior art, it's as striking, detailed and beautiful as the cover. Not only do you get full pages by the cover artist, but also many other pieces by many others, some of them in black and white like the one Mike Mignola did in the early stages of his career, and others also lifted from previous publications about Glorantha, like the Guide to Glorantha or the Glorantha Sourcebook. Among the artists you can find Lisa Free, who also did the bestiary illustrations for RuneQuest 3rd edition, Roger Raupp, author of the amazing covers for Sun County and The River of Cradles, and other incredible artists like Michelle Lockamy and Miguel Coronado, to name but a few. The book is 446 pages long, and it contains a lot of art. But, what's even better than just excellent art in a RPG book? Well, excellent art that really makes the setting come alive. This is beautifully done in RuneQuest: Roleplaying in Glorantha, as each and every piece of art helps the reader visualise the very distinct fantasy world of Glorantha. The attention to detail that has been put into the art direction makes the Bronze Age aspects of the setting stand out in a glorious, colourful way. The art really makes the reader get Glorantha in an instant. Besides, the full-page art that precedes every chapter depicts scenes of the adventures of the example characters in the book. For example, the chapter about combat includes a piece of text about how the example character Vasana, mounted on her bison, fights a group of monstrous broos, and the illustration that opens the chapter shows you precisely this scene. Moreover, some of the rules are illustrated, like the language families or the amount of coverage each size of shield offers. So it's all very well connected: art that shows the setting and the rules at the same time. All in all, the art in this book is so good it's cool to flip its pages only to admire it. And this means this is the RuneQuest edition I wish all the previous editions would have looked like. As a teenager, I remember being a bit frustrated by the fact that much of the art in RuneQuest 3rd ed. 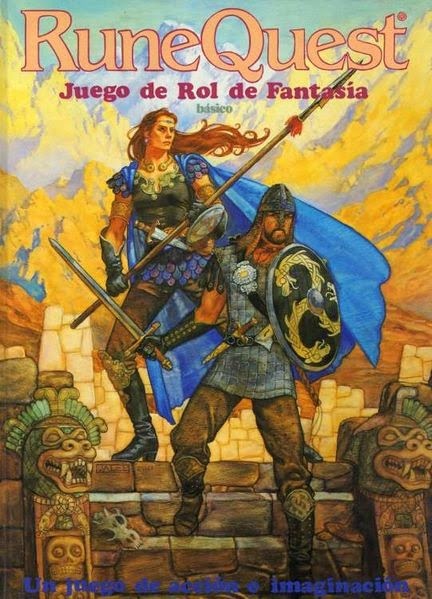 was terrible, especially if you compared it with other big games like D&D (see the giant and the dragon of the Spanish edition here). Well, it's taken some time, but finally I can say I'm very proud of the art in RuneQuest! The expectation raised by the launch of RuneQuest: Roleplaying in Glorantha, together with a well-managed hype campaign, are two of the reasons why this book was the #1 best-selling PDF on Drivethru during the first weeks after its release. I think no one can deny that a big part of the motivation behind the expectation has to do with nostalgia. This is a big sales-drive nowadays and one I wish I could say I'm free of. After all, RuneQuest has more than 30 years of history, so fans who played it years ago are keen on seeing an updated version, expecting to hopefully revive those fun games they enjoyed. However, with 6 earlier editions meaning 6 somewhat different sets of rules, it's only natural that every fan prefers this or that rule from this or that edition over all the rest. For example, the crowdfunding campaign for the reprint of the classic 2nd edition was incredibly successful and showed that there are many fans of the 1978 version of the rules. On the other hand, fans who started playing RuneQuest with the 3rd edition will prefer the new edition to keep most of its rules, and the same goes for those who enjoyed the 6th edition the most. Already in the introduction you can learn about some of the rules of the game. To begin with, it's still a D100 game like its predecessors, meaning the degree of success or failure of the actions of player characters is decided by the roll of dice with 100 possible results, success being a result equal to the score the character has in a particular skill or less. Skills then, have a score described in terms of percentage of success, which makes it really easy to know the level of proficiency in each of them. For example, if my character has a Jump skill of 45%, I'm immediately aware of the odds my character has of falling down a chasm if she tries to jump over it. A new but small rule of this edition is that, whenever you need to round a score up or down, you always do it in the way that benefits the players. Apart from that, you also get a good summary of the distinctive features both of RuneQuest and Glorantha, like: combat is dangerous, everyone has magic, cults, mythology, heroquesting or it's a Bronze Age world. 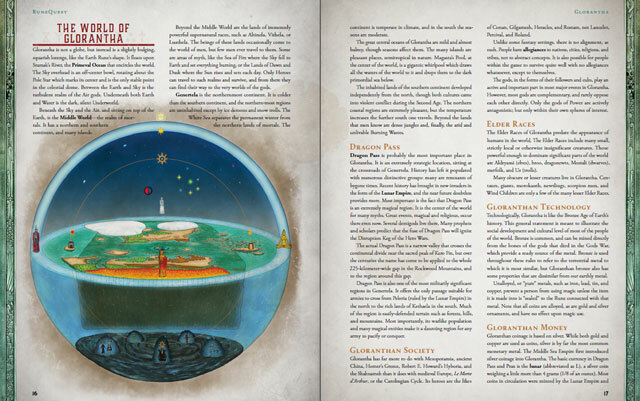 Glorantha itself gets its own short chapter, with a brief history of the world focused on Dragon Pass, just 4 pages that look like the shortest possible introduction to Glorantha you could give to your players. And if you want to go deeper into the background, get a copy of The Glorantha Sourcebook (read a review), as it is also mainly focused in Dragon Pass and the Lunar Empire. It's also important to note that the "current" year is 1625, when the Hero Wars are beginning. Some fans had complained in the past that the prophesied Hero Wars never ever ended happening, as the official supplements never covered them. Well, now they do! In my case, I could have waited still some years, since my campaign hasn't reached that point yet, but this is another of those choices Chaosium had to make knowing that it wouldn't please all the fans. On the one hand, this is somewhat disappointing if you have an ongoing campaign set around the year 1620, which was the "current" year in earlier editions, but you can keep using the older published scenarios and campaigns until you get to that point, and most of the future scenarios will be usable anyway. Besides, the HeroQuest supplements are still covering that time, so you can adapt them. On the other hand, this means Chaosium will be covering fresh ground, a new perspective of the Gloranthan background. And these are interesting times, different from the usual Lunar occupation of Sartar of earlier editions. Now the occupation is over, and the classic clash between the Lunar Empire and the Orlanthi tribes is more balanced. There will be more intrigue as in Game of Thrones, and many more tones of grey, as the once oppressed slowly turn the tables. In game terms, this also allows for more character diversity. For example, in the Gloranthan publications of past editions, focused on the Orlanthi rebels, you could hardly play with a Lunar character, since they were the main enemy. Now, however, you can play a Lunar who sides with the increasingly powerful Orlanthi side during the war. The chapter about character creation is named "Adventurers", as this is the name the main characters receive, in the same way characters in Call of Cthulhu are called "investigators". It includes some old rules but mostly new ones. 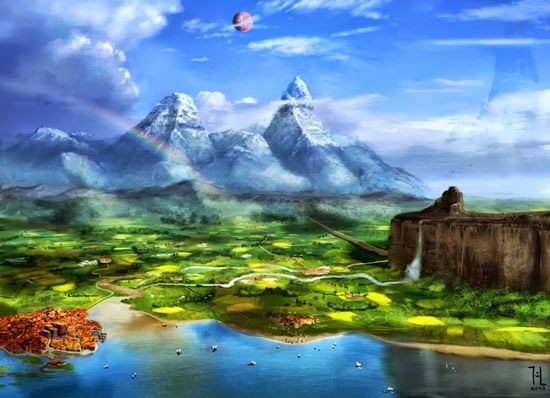 Being focused on the Dragon Pass area, the book only allows the creation of humans from this land and its environs: Sartar, the Grazelands, Esrolia, Tarsh and Prax. The bestiary (sold separately, see the review) includes rules for creating non-human characters like elves, trolls, dwarfs and others. And future supplements will allow you to create characters from other homelands. Anyway, choosing your character's homeland is the first step. The second step is determining your family history. 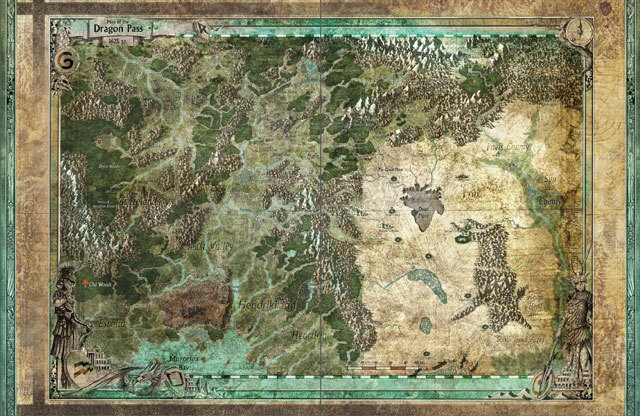 The maps are also beautiful, although they need to downgrade the background texture so that the names are easier to read. This is generated by rolling dice in a series of charts, each one focused on an important event of the history of Dragon Pass. The history starts with one of your grandparents, continues with one of your parents and ends up with the first adventures of your character. You can also choose the result instead of rolling. This is cool for two reasons: first, it is a great way to introduce the setting to the players making it personal. And they create the background story of their character even if they know nothing about Glorantha. Second, depending on the results, you get different Passions, Reputation and modifiers to certain skills, the perfect mix of setting and rules. For example, after the Lunar invasion of Sartar, the Lunars encouraged the Orlanthi tribes to kill each other and there was much strife. Your father may have died then, fighting against the Telmori, and in that case you get the passion Hate Telmori 60%. Along the way, you can also determine your uncles/aunts and your siblings. If you prefer, you can also skip this process and just assign some passions directly. This was surely inspired by the clan questionnaire from Sartar: Kingdom of Heroes, which in turn took inspiration from the first Gloranthan videogame: King of Dragon Pass. Excerpt of the family history: Did your grandfather participate in the Building Wall Battle? Find out what happened to him. 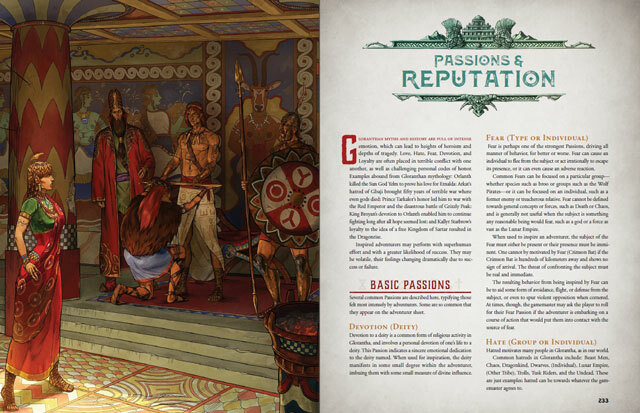 During the generation of your character's family and recent history you already get two of the greatest new rules of RuneQuest: Roleplaying in Glorantha: passions and reputation. Although passions are already present in RQ6, that's a rule Greg Stafford had created many years ago to include in a future 4th edition of RQ, but ended up including it instead in the Pendragon RPG! Passions work like skills with a percentage, for example: Loyalty (Sartar), Love (family) or Fear (dragons) or Hate (Praxians). These are emotions that drive your character. You can roll under their score if you're not sure how your character would act in a given situation, and you can use them to augment other skills. For example, if you were looking for your lost brother in the forest, you could roll under your passion Love (family) 65% and if you succeed, you would then get a bonus to the Search skill to see if you find your brother. Although I have never played Pendragon yet, I have been using these rules in my samurai campaign with RQ6 and I can say they make your games better. Reputation is accumulated as your character performs great deeds. The GM can then use your score in reputation to determine if a NPC knows about your character. Reputation can also be used to augment social skills with the same mechanic as passions. For example, if you need to roll for Oratory or Intimidate, your Reputation may help you. Vasana meets Argrath in one of the most incredible pieces of art in the whole book. Together with runes, these 3 aspects make your character something more than just a collection of stats and numbers. This means characters have a whole new dimension, a soul of their own. Regarding the runes, you choose them in the next step of character creation, and have scores in % like skills. The runes help determine your character's personality, have an influence over her characteristics and are useful to determine the cult she belongs to. You choose 3 elemental runes: air, earth, fire, darkness and moon, and then choose two main power runes, which are set as opposite pairs. For example, if you have 75% in the Death rune, you will have only 25% in the Life rune. The list of runes has been simplified to better conform to these opposed pairs, so for example the Communication rune is considered here part of the Harmony rune. Finally you distribute some points in all the runes you have. Part of the RuneQuest adventurer sheet where you write down your rune scores. 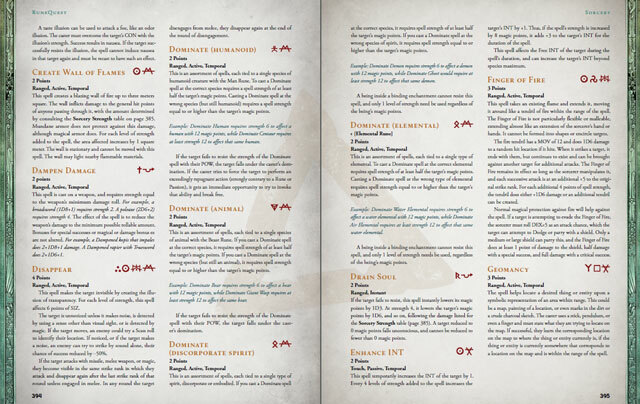 Finally, RuneQuest has runes in it! Runes also work like skills, defined as a percentage, and they have 4 uses. First, you use them to cast rune magic. If you want to cast a rune magic spell related to the air rune, you will have to roll under your score in that rune. Second, you can use them as passions, because each rune represents some personality traits, so the stronger you are in a rune, the stronger your personality traits related to that rune are. For example, characters strong in the Movement rune are changeable, energetic and rebellious. Runes also have an impact on your character's characteristics. For example, characters who choose the Moon rune as their main rune will have +2 to POW. Finally, you can let your character be inspired by the runes and it works like a skill augment that can give you a bonus to another skill. However, runes and passions have a downside that prevents players from overusing them, because if you fail or fumble the roll, you get a penalisation on the skill you were trying to augment. What this means is that players will end up only using those runes and passions to augment in which they have a good percentage, so important runes and passions will be the ones more often driving the adventurer. Finally, runes have a dark side, because if you have a rune over 80%, the GM can force you to act in a way related to the personality traits the rune stands for, or else drop your percentage in that rune to 80%. I like this new mechanics a lot. It's cool to have runes being so central in a game called RuneQuest! On the other hand you have classic rules defining characters such as the seven characteristics: Strength, Constitution, Size, Dexterity, Intelligence, Power and Charisma, which are determined by rolling dice with results between 3 and 18. To some it may seem surprisingly old-school to use dice rolls to determine stats, as more modern games allow you to better choose the character you want to play. For example, if I want to play a warrior, but I get a low dice roll in Strength I will be disappointed. However, the rules also specify that characters in RuneQuest: Roleplaying in Glorantha are extraordinary people in the path of becoming heroes, so the rules provide means of ensuring you get good characteristics. Rumour has it that the soon to be published GM Pack is going to include a points-buy option for creating PCs, but as always, your GM or your group will end up deciding what they prefer, no matter what the rules say! Both have pros and cons and every GM ends up houseruling this a bit. Pros and cons of rolling: you may get imperfect PCs that may be fun to run in spite of lacking some points here or there. Pros and cons of allocating points: you can play the kind of character you like the most, but you end up optimising. One change I like a lot is that the Charisma characteristic is no longer a dump stat, and it now has many uses, especially as regards to magic. Characteristics are used to calculate the skill modifier categories very similarly to RQ2, and attributes. Some of these attributes have been present in every edition of RuneQuest, like damage bonus and location hitpoints, and there are also general hitpoints like in RQ2 and RQ3, although they are calculated a bit differently, others already appeared in RQ6, like healing rate. Finally, the character's skills are defined by their culture or homeland plus their occupation and cult. Each homeland and each profession gives your character points in some skills, you just add them up to the base percentage, add some more extra points and you're done. It's a very quick system that produces quite different well-rounded characters with a rich background. The default characters are always 21 years old, and they usually start with high percentages in their main skills, around 80% or even 100% (the maximum you can start with). However, there are notes to help you make younger or older characters. All along the text you find examples of Vasana's Saga, a Gloranthan adventurer that is created and then goes on to live adventures that serve as examples of play. Like Anathaym in RQ6, Cormac the Pict in RQ3 or Rurik in RQ2, this is an awesome way to learn and clarify the rules. However, these little narratives go beyond just game examples, and they are useful to visualise the world these characters are treading. What's more, they give a glimpse of the kind of adventures you can enjoy in this setting. They remind me of the diaries of the merchant Biturian Varosh in Cults of Prax, the old supplement for RQ2. Later on you can actually see Vasana's game stats together with those of her companions, since they are included for you to use as player or non-player characters. They are the same as the ones in the RuneQuest Quickstart, but one more is included here. This hunter from Old Tarsh worships the bear god Odayla and has a lynx as a companion. Combat has always been dangerous in RuneQuest and this is no exception in RQG. It is a visceral blow-by-blow exchange that usually ends in a bloody way, with one of the opponents decapitated, bleeding unconscious on the ground or clutching the wound in his severed arm. It's simulationist and it feels quite realistic. If you have no other option than to enter the fray, be sure to wear good armour and cast your protective spells first! The illustration at the start of the Combat chapter is one of my favourites. It's by Simon Roy, an amazing artist. Who attacks first is determined with strike ranks, whoever's action costs the least ranks goes first. That takes into account your weapon's length so you'll logically attack first with a spear than with a dagger, but your Size and Dexterity also have an impact. Attacks can be parried, but there are several degrees of success or failure that offer different results. So for example, if you are attacked with a critical success (5% or less of your skill score), but your parry roll is not as good, perhaps a special success (20% or less of your skill score), then your parrying weapon will likely be damaged, and the rolled damage points that are not absorbed by the shield or parrying weapon nor by your armour will be subtracted from the hitpoints you have in the body location that was hit (determined by another roll). You can also choose to dodge an attack, but that is a bit riskier. On top of critical, special and normal successes, you can also roll failures and fumbles. The different fumble tables in RQ3 have been unified into just one, which makes it easier to look up. Each type of weapon also inflicts different kinds of damage. For example, if you get a special success with a spear, you roll damage twice and the spear impales and remains stuck in the victim. Slashing weapons such as swords and axes also do double damage with a special success, and they can incapacitate the victim. Finally, crushing weapons such as maces and warhammers adds up the maximum damage bonus of the attacker to the normal rolled damage. All in all, this is a slight improvement over the rules in RQ3, but not as detailed as the rules in RQ6. So you'll probably like these rules if you think RQ6 is too complex for your tastes. However, I think that crushing weapons are at a big disadvantage compared to the effects of the other weapons, and they should have been better balanced. As they stand now, they are only good if you have a hefty damage bonus. If your combat skill goes over 100% you have two advantages. First, as in RQ6, you can subtract the amount of your skill that surpasses 100 from your opponent's combat skill if it's lower than yours. This is helpful to really give an advantage to combatants with skills over 100%. That also means we won't be seeing NPCs like Ralzakark, who in RQ3's supplement Dorastor is described as having 355% in his Attack skill with his best weapon. So I'm very intrigued to know how RQG will handle the combat between high-level heroes and demi-gods. And second, you can split attacks like in RQ3. For example, if you have 120%, you can do two attacks of 60%, which certainly helps when you are outnumbered. Taking into account how dangerous combat is in this game, but also how central to the stories it usually tells, there are 3 factors that make it even more dangerous: first, the fact that Size is not as important for hitpoints as in previous editions, second, the absence of luck points to artificially save you or reroll a crucial roll, and third, the fact that when your character is reduced to 0 hitpoints, he dies at the end of the round, lessening the chances of some comrade healing you up with magic. I know that in RuneQuest you need to be careful and try to avoid combats if possible, but it's also true that the sword and sorcery genre often leads you to combats. On top of that, there should be some means to end it up in a non lethal way. For example, it could have been cool to have some mechanics for disarming or knocking out your enemies. Yes, there are mechanics to aim your blow to a specific body location, so you could target your opponents weapon arm in order to disarm him (and that's probably how they do it in The Illiad), but still. On the other hand, RQG offers at least one way to avoid death, called "ransom". In the world of Glorantha, everyone's life has a price that depends on your occupation. So when a combat is going awry, you can shout "ransom!" and your attacker might be persuaded to spare your life in exchange for a set quantity of silver. This is a concept players will need to get used to. Just don't try that while fighting wild or Chaos creatures, though! 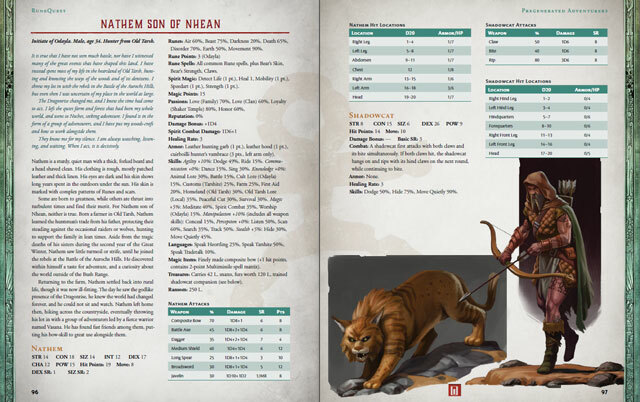 EDITED (July 3rd, 2018): Some weeks after the release of the PDF, Chaosium shared among the fans a set of clarifications and additions to the basic rules called Rune Fixes. These include rules for disarming and subduing opponents (very similar to the ones in RQ3). It's good to know that Chaosium listens to its fans! 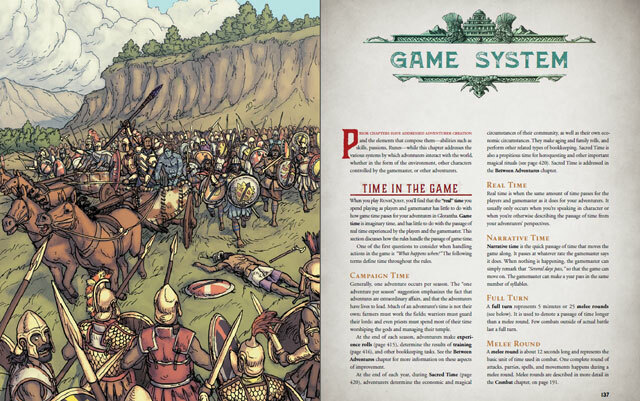 Something cool about the combat chapter in RQG is that it includes rules for fighting on chariots, and rules for fighting in phalanxes, both of which make this edition really Bronze Age! The Game System chapter also includes some cool rules while keeping some old ones. For example, it's strange that they have kept the Resistance Table from RQ2 and RQ3, when the new Call of Cthulhu 7th edition has already done away with it. I mean, it's not difficult to use at all, but if they already include skill vs skill opposed rolls, why do you need the Resistance Table for? They could have made the rules simpler by using only one of those systems. And speaking about opposed rolls, the mechanic for pitting skills is not of my liking, because it can produce many ties, which lead to nothing. In RQ6 you can also get ties if both participants fail their roll, but if they both roll the same level of success (for example, a guard rolls a normal success of his Listen skill and the thief rolls the same level of success in his Move Quietly skill, the winner is the highest roll). Of course, RQG has an additional level of success, the special one, which reduces the chances of getting a tie, but for me this is still unsatisfactory. A possible solution would be to let the winner be the participant with the highest skill in case of a tie. As for the cool new rules, we finally get rules for chases! I don't understand why these rules are missing from many RPGs, as chases can be a very exciting scene outside from combat. So I'm very glad to find them included in RQG. The rules are quite simple, and remind me of the ones used in the excellent scenario Garhound Contest from the Sun County book for RQ3. I find it weird though, that there's no indication about fatigue rolls in the whole book. Just adding a line about making a CONx5 roll to avoid a penalisation on some skills would have been enough, and they make a lot of sense in chases. I'd also have liked to see some mechanics to deal with long important negotiations, but at least this edition includes more social skills, like Intimidate, Charm or Intrigue. Speaking of skills, I like seeing interesting new additions like Alchemy, Insight, Library Use, Manage Household, Farm or Battle! The rules for battles are rather simple though, and I hope we will be seeing more juicy rules to play mass battles in the upcoming GM Pack book. Curiosity: this chapter includes the famous Dropped Lantern Table, which is a bit of a joke. Sandy Petersen is supposed to have commented long ago that "it's just not a fun game if it doesn't have a Dropped Oil Lantern Table", so it was originally included in old versions of RQ as a joke on all those classic RPGs who had lots of weird tables. Magic is part of the physics of Glorantha. 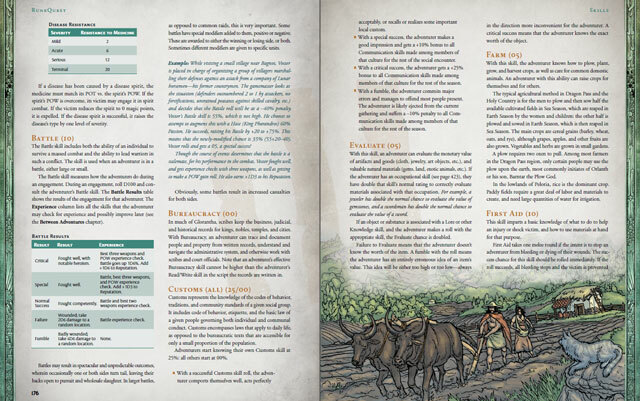 It's an integral part of the setting, and even the lowliest farmer knows a spell or two to make his life easier. That's what makes combat somewhat more survivable, as there's lots of protective magic and also often someone who can heal you up or even reattach a lost limb. 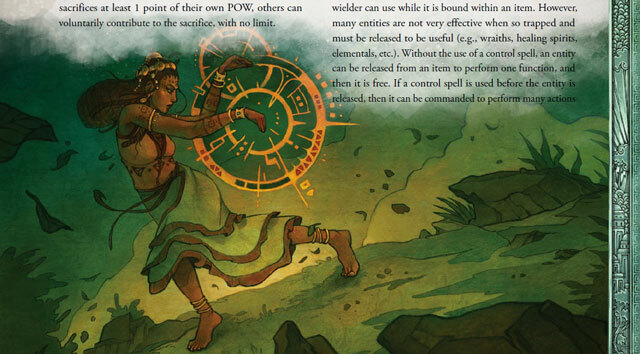 That's also why about half of the 446 pages of RuneQuest: Roleplaying in Glorantha are devoted to magic. RQG describes 3 types of magic: Spirit Magic, Rune Magic and Sorcery. The rules include enchantments that are very similar to RQ3, and I love it because I miss them a lot in RQ6. However, these require sacrificing POW points, a mechanic I have never liked. The thing is, I don't know very well how to houserule this! What I like is that the enchantment rules have subtle changes that make it more difficult for adventurers to end up loaded with enchanted items such as bound spirits, for example, and that's great. Spirit Magic is mostly the same as in RQ3. Every Gloranthan knows some of this magic and they use it by rolling POWx5 and spending magic points. As with any other kind of magic, offensive spells require a successful POW vs. POW roll on the Resistance Table. Something new however, is that you can use the Meditate skill in order to increase your chances of success in these rolls. All the classic spirit spells like Bladesharp and Befuddle are included, up to 53 (! ), but many of them have small changes that are an improvement over earlier editions. For example, I've never liked the spell Fireblade in RQ3 because it seems overpowered, but in RQG the caster needs to concentrate in order to keep the magic flames going, so this balances a bit its effects. As for cults, I would have liked the rules to make shamanic cults like Waha more different to normal rune cults, since both have initiates, rune lords, priests or shamans, all of them using both spirit spells and runic spells. In this regard, I very much prefer the RQ6 take on animism. However, I must say I love the changes RQG introduces. Shamans are encouraged to negotiate with spirits to get some services, not only through spirit combat, although the GM needs to improvise what exactly the spirit demands. At the same time, spirit combat has been greatly improved over RQ3 and is now a bit more interesting, and above all, quick. For example, these rules include now criticals and fumbles, and there are new skills such as Spirit Dance or Spirit Travel to move around the Spirit Plane. Moreover, there are new rules to make fetches and shamans much more interesting than in the earlier Chaosium editions. In fact, we have been using these rules originally created by Sandy Petersen for years in my RQ3 campaign. They really go a long way to make shamans much more fun to play, as they offer different shamanic powers to choose from. Finally, the process of awakening the fetch, crucial to becoming a shaman, has also been improved and is now much more gameable than it ever was in RQ3. Overall, an improvement over the last edition by Chaosium. And if you want to know more about spirits, read the Glorantha Bestiary. Rune magic is the magic of the gods, miracles they perform through their initiates and priests, and it has also been greatly improved in this edition. Even before RQ6 introduced renewable divine magic for initiates, many RuneQuest fans like me were already using similar house rules for RQ3. So now initiates use rune magic much more often, which is at it should be in a world where the relationship between deities and their followers is so important. To regain the rune points they spend to cast rune magic, initiates need to attend worship ceremonies. There they need to use the Worship skill successfully, but even if they fail, they'll regain part of the spent points anyway. Now you can even Sanctify a special place to replenish your rune points, which is helpful for adventurers who are away from their homelands and temples. In order to get new spells and rune points, you need to sacrifice POW, a mechanic I've never liked much, but at least now there are some more opportunities for increasing your POW than before. The hierarchy in religious cults is important, with every position incurring higher responsibilities, but also greater power. The difference between initiates and priests or rune lords is that the latter renew more rune points during holy days, which can be annual, seasonal and even o on a weekly basis. Besides, rune lords and priests now are better protected against spirit attacks and, in general, spirit attacks are a lot more survivable even if you're not a shaman. Of course, this is a welcome change in a world where spirits are everywhere, including the malignant ones. I also love the detail that making sacrifices of objects or animals improves your Worship roll, it is very Bronze Age, but there should be other rewards, otherwise characters will stop making sacrifices when their Worship skill is high enough. 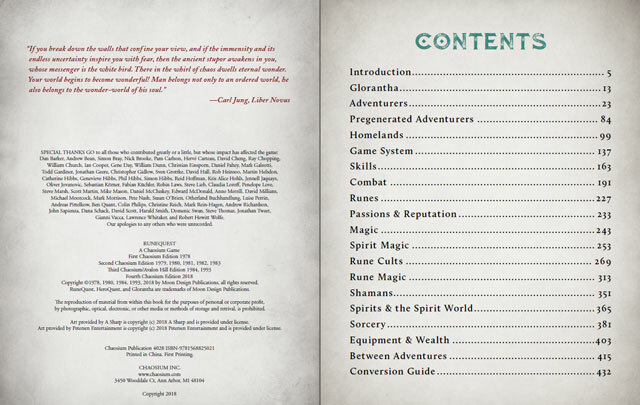 The book also includes short descriptions of the main cults in Dragon Pass and the lands around it, such as Orlanth, Ernalda, Babeester Gor, Storm Bull, Issaries, the Seven Mothers, Engizi up to 21 rune cults, together with the descriptions of 68 rune spells (!) that include all the classics like Sever Spirit or Berserk, and also spells only from RQ2 like Multispell and Dismiss Elemental. And if you want more rune spells, there are guidelines to create more! A small detail I also liked is that wyters, or the minor protective gods of a community, are described in game terms. Another great change in both Spirit and Rune Magic is that now the Charisma characteristic becomes much more necessary. For example, the maximum amount of spirit magic you can know depends on your Charisma, and in order to attain rune lord status in a cult you need to have at least Charisma 18, since you will be an example to other initiates and will lead them in holy missions. On the other hand, something I don't like is that the maximum level of spirit and rune magic you can cast is not capped at all. I would put a cap depending on the cult hierarchy. For example, spirit and rune magic of up to 4 points for initiates, and 3-point rune spells only available for rune lords and priest. Or even better: 1/20 of your rune skill would be a sensible limit for the maximum rune points you can stack. Otherwise, expect every humakti initiate to cast his Sword Trance rune spell (1 rune point to cast) powered with 11 magic points for a +110% to his Sword skill!!! If you pair that with the rule for skills over 100% I've mentioned above, you may begin to see why humakti are only going to fight among themselves in RQG, the rest will just surrender on sight (!). In RQ3 sorcery is the kind of magic that can get out of hand, in RQ6 it's Mysticism, and in RQG it seems it may be rune magic, or perhaps it's just an errata, as the PDF is currently being corrected of typos and such. Sorcery is the manipulation of the logical laws of the universe. And in Glorantha, that means controlling the runes. This is the type of magic that has changed the most compared to previous editions and it's now so much more Gloranthan. Sorcerers manipulate spells with certain techniques and runes. The six techniques are: Command, Combine, Separate, Summon, Dispel and Tap. Sorcery spells are the combination of one or more techniques with one or two runes, and there are 58 spells described, with guidelines to create more by combining techniques and runes. For example, casting the Dampen Damage spell requires knowing the Dispel technique and having an affinity with the Death rune. This means that sorcerers are know much more specialised in a set of runes and techniques, so the range of spells they know is more focused. I had the opportunity of playing such a sorcerer in a game set in Casino Town, but using the draft rules of Adventures in Glorantha by The Design Mechanism, that were based on the same principles (as stated in the Guide to Glorantha), and they are very cool, especially in the hands of a creative player! Sorcery is still a very flexible type of magic, as it allows you to increase the strength of spells, its range and its duration, but at a cost. And that cost is magic points, Free-INT and casting time. Sorcerers need lots of magic points to be effective and their spells need a lot of time to cast. They also need one point of Intelligence to memorise each spell, and the remaining INT is the maximum points they can augment the strength, range and duration with. However, unlike RQ3, they don't need a spell to create spell matrixes to liberate their INT, just the sacrifice of points of POW. I'm sure these 3 factors are there to limit their power level, which in previous editions could get out of hand. However, the sorcery rules included in RQG are just the basic notions so you can play the little sorcery present in Dragon Pass. There are small glimpses in the rules that suggest that sorcerers from lands who specialise in this kind of magic, like the Malkioni, will be much more powerful. So we can only wait for a future supplement to be able to see in action the full potential of sorcery. For the moment, four very basic schools of sorcery are briefly described: Malkioni, Aeolianism, Lhankhor Mhy (sages know a few sorcery spells) and Lunar Sorcery. One detail I like a lot is that sorcery is sympathetic magic, so a sorcerer can have better chances of casting a fire spell if he casts it on Fireday on Fire Season, for example. And places and components also help in this matter. For example, carrying a torch would also help this sorcerer. Separate + Magic rune = Drain Soul spell, which leaves your enemies with zero magic points, and therefore unconscious. At the end of the book there are two chapters that really surprised me, and where one can see a strong influence of the Pendragon RPG. Under Equipment & Wealth you not only get the usual lists of equipment and services, but also standards of living, the cost of retinues, and most interesting of all, the amount of silver produced by the land that a person can farm in a year or the equivalent produced by herds and cattle. The explanation of the economics of temples is also very interesting. I think it's great you get this level of detail in aspects of the world of Glorantha that are so pervasive to everyday life. This may seem superfluous to people who are used to roleplaying games where adventurers are more like murder-hobos whose only purpose in life is to get more magic items, so that they can kill bigger monsters. 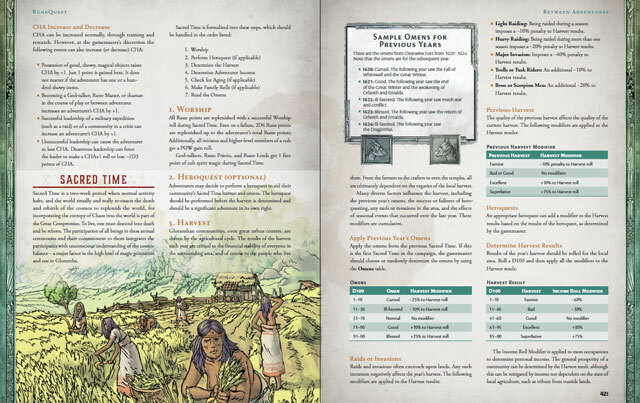 While this kind of play is fun and perfectly possible, the rules in RuneQuest: Roleplaying in Glorantha are geared towards playing campaigns in which adventurers have strong ties with their communities, usually family, clan, cult and tribe. The fact is, heroes are nothing without the communities who support them, and the heroes' deeds are mainly for the benefit of those communities they belong to. This is explained in the last chapter Between Adventures. For example, in RQG adventurers are supposed to adventure once every season at the most, and when they come back, they have the chance to improve their skills. This is done with the same mechanic in RQ2 and RQ3, where you only improve those skills that you have used. You can also train your skills and your characteristics by paying a teacher, or learn new spells. Playing one adventure per season makes years go by faster, which creates the kind of campaign where players can see the world evolve around their characters, quite often based on their actions. What happens at home is also important in RQG. Like Pendragon has the winter-phase, so RQG has Sacred Time, a period at the end of the year when everybody stops their everyday activities and focuses on performing the important sacred rites to receive blessings of the gods and omens for the coming year. This is the season when players have to make some rolls related to their communities, which include: harvest, omens, optional heroquests, determining the adventurer's annual income and family events. This is where those new skills such as Manage Household and Farm are useful. These mechanics help players care for the well-being of the communities their characters belong to and reinforces the concept that Gloranthan heroes are all but alone. It reminds me a lot of the videogame King of Dragon Pass, but also about the kind of epic campaigns that have been published so far for HeroQuest Glorantha: like the Colymar campaign or The Eleven Lights. If the campaign that Chaosium has in the works for RQG is half as good as these, and you think you can like this sort of campaign, you can expect to have lots of fun gaming in Glorantha with RuneQuest. 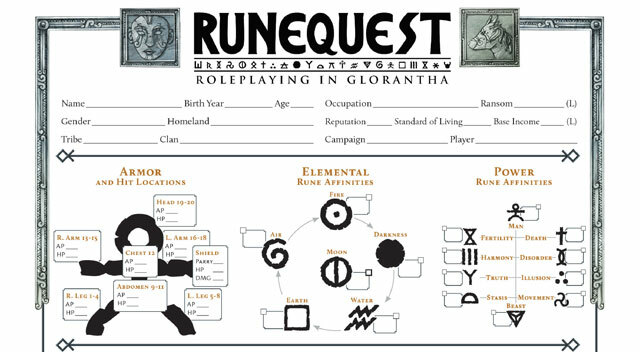 You can watch a game of RuneQuest: Roleplaying in Glorantha, run by one of the authors, here. - Glorantha Bestiary. Read the review here! It contains almost 200 creatures, together with rules and cults to play elves, trolls, dwarfs, etc. - GM Screen Pack with 3 adventures, information about the Colymar tribe, NPCs, PC sheets, GM screen and Gloranthan calendar. - The Glorantha Sourcebook. Although this book does not include any game details, it contains all the background you may need to get inspiration for epic campaigns. Read the review here. - The Gamemaster Book, rules for preparing scenarios, heroquests, heroes and much more. - RuneQuest Starter Set. A box like the Call of Cthulhu starter set, only for RuneQuest. - Adventure Book. About 10 quick adventures to start playing right now. 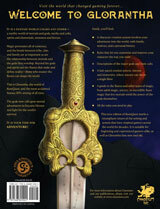 - Gods of Glorantha with more than 50 cults with long descriptions including myths. - The Gods of Terror, cults of Chaos. - The Dragon Pass campaign, a seasonal campaign doing heroic missions for king Argrath. - Find out other forthcoming books here. 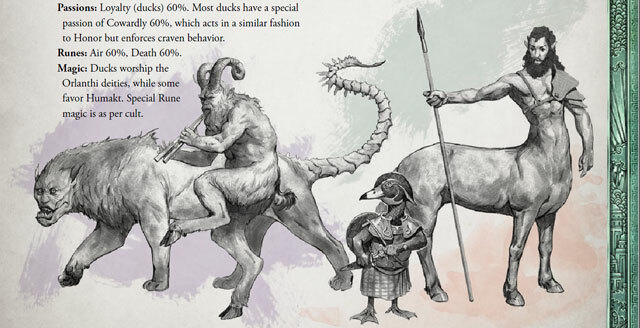 The Bestiary includes many Gloranthan creatures, like manticores, satyrs, ducks and centaurs. The art and the new rules make this an excellent book for any fan of Glorantha or anyone who would like to start playing epic games in this fantasy Bronze Age world of magic and mythology. Even if you prefer playing in Glorantha with some other ruleset, like HeroQuest Glorantha or 13th Age Glorantha, this book may be worth getting just for the art or as a nice introduction to new players. And if you prefer to keep playing in Glorantha with some previous edition, you will find in RQG many interesting mechanics to steal and use. As any other game with many previous editions, some people may criticise the fact that RuneQuest: Roleplaying in Glorantha isn't closer to what they think is the best combination of RuneQuest rules. For example, if you are a fan of RQ3 and RQ6 like me, you probably won't like the fact that the book doesn't include any fatigue rules at all. However, since all RuneQuest editions are very adaptable, it is very easy to include what you like from any edition into RQG or what you like from RQG into the previous edition of your choice (that's certainly my case). On the other hand, one could criticise for example, that the book is not complete without a bestiary or some NPCs or some introductory scenario. But, since all that is included in the two accompanying books, I don't see it as a problem. In the case of RQ3, you had a book with all the rules, and then a book to create Gloranthan characters (Genertela) and another one with all the gods (Gods of Glorantha). 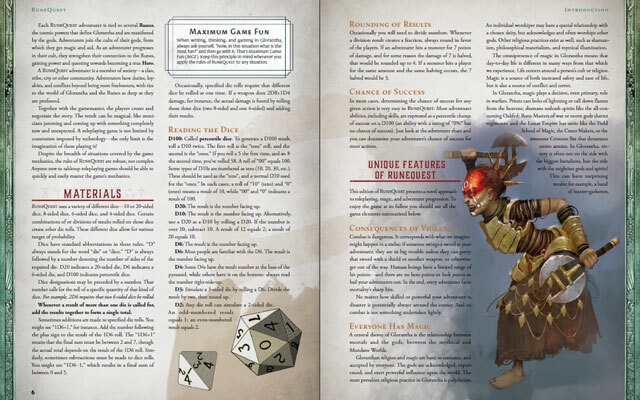 With RQ6, you also have a book with all the rules, and the supplement about Glorantha was also going to include character creation rules only for some homelands like RQG does, so any way you prefer your game to be, you end up needing more than one book to play in Glorantha with RuneQuest. Really, if you wanted it all in just one book, it would have needed at least a thousand pages! - You like to play exciting stories in the fantasy world of Glorantha with a simulationist ruleset that produces realistic results, but is not too complex to learn. 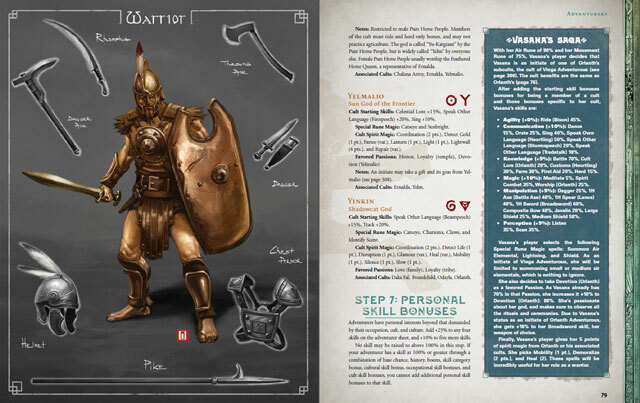 - You want to start learning about Glorantha with a very accessible book and classic RPG rules such as hit points, set list of skills, etc. - You want to play epic campaigns set during the Hero Wars. - You enjoy well-made art in RPGs. 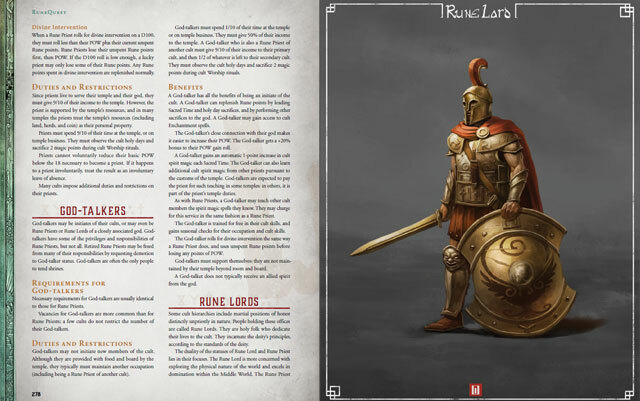 - You believe some other edition of RuneQuest is absolutely perfect to play in Glorantha. - Nowadays you only have time for narrativist games like HeroQuest or Fate. - You don't like neither Glorantha nor any fantasy Bronze Age settings. 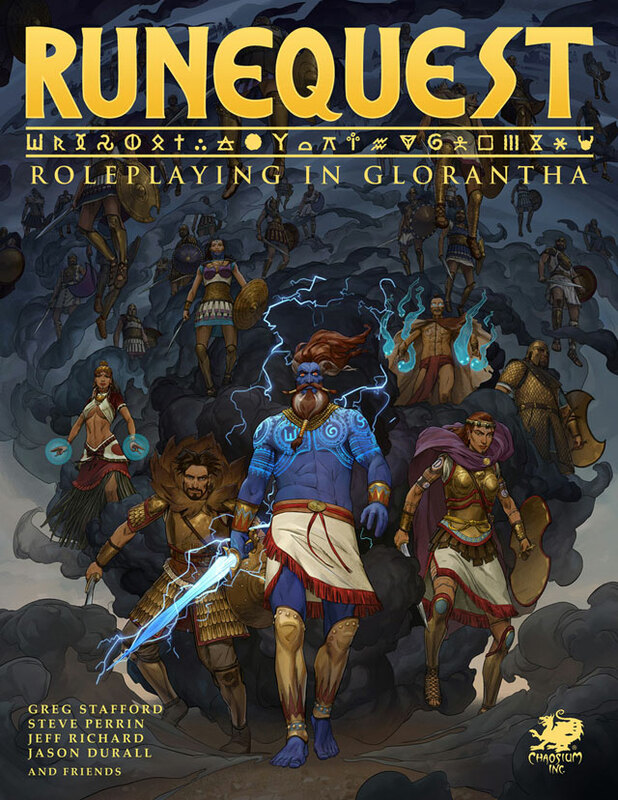 You can buy the PDF of RuneQuest: Roleplaying in Glorantha for 28$ at Chaosium and at DrivethuRPG. Be warned though: only if you buy it at Chaosium.com will you get a coupon that will later allow you to buy the hardcover book with a discount equal to the price of the PDF. The hardcover book is 55$. Be my guest! :-) And thanks for your kind words. You can also use the Translation Gadget on the right margin, if you want. Soon I'll post my review of the Glorantha Bestiary, also in English. Quality review! I had been using Heroquest for my Gloranthan 'Fix' ,having 'cut my teeth' on RQ2 & RQ3, but based on your review, I've 'bitten the bullet' and purchased a copy of RQG. Cheers! Thanks for your comment, Victor, I'm glad you liked my review. In fact, HeroQuest Glorantha is another great game, but even if you and your players prefer its narrative mechanics, the new RuneQuest will also be good for inspiration and to show some great Gloranthan art to your players! Excellent, in depth review, one of the most detailed I have seen. This is indeed a great edition of RuneQuest, and I look forward to future publications in the new RQG line. Like you, I'm also looking forward to the next publications of this line, specially after knowing what's in store for RQG!